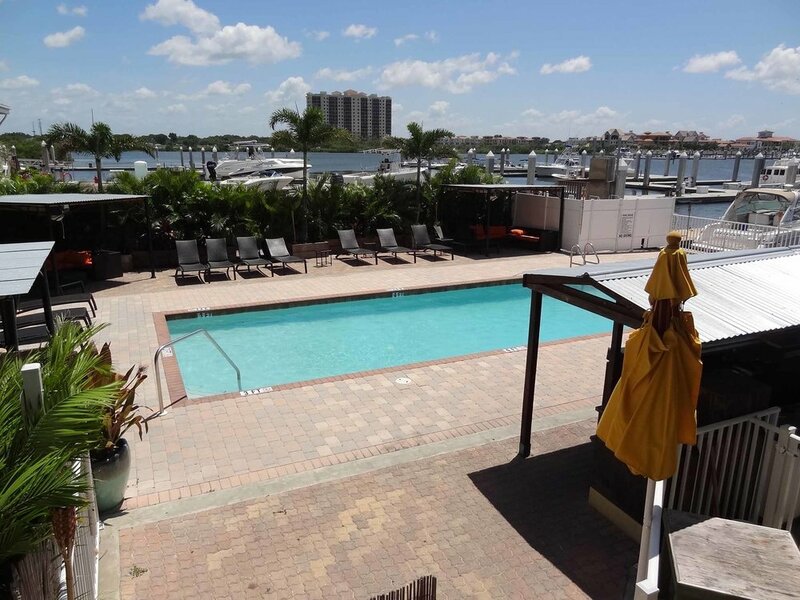 Hula Bay Club and Duke's Retired Surfer's Island Bar is a Florida beach bar located in Tampa. Discover this great Florida beach bar. Unique Feature: Club for "retired surfers"
Hula Bay Club is located on Tampa Bay's waterfront. It is a tropical paradise right out of Hawaii. You can enjoy a meal here at the Hula Bay Club. However, the drinking spot is Duke's Retired Surfer's Island Bar. This Florida beach bar knows how to do it right. The key to a good Florida beach bar is live music and being on the water. Duke's is on the water, and the music is almost always live. Duke Kahanamoku was an Olympic gold medal swimmer and the father of modern surfing. So, keeping with the swimming thought, Duke's has a swimming pool for guests and patrons of the bar. Duke believed in enjoying life to its fullest, and this Florida beach bar embodies that feeling. Hula Bay Club wants their patrons to come and enjoy a great tropical experience. The food is good. Try a Hula Burger and wash it down with an Hawaiian Freeze. Sit back and relax and listen to one of the fun and lively bands. You can get to this Florida beach bar by boat or car. You can watch sports or listen to the music, but no matter what you do (and we promise we won't tell) you will have a good time at this Florida beach bar. No two Florida beach bars are alike, and this one is unique and wonderful in its own right.